Man Suspected Of Mailing Pipe Bombs Is Indicted And Faces Life In Prison A 30-count indictment was handed up in Manhattan federal court on Friday for Cesar Sayoc, the Florida man who is accused of sending pipe bombs by mail to prominent Trump critics. 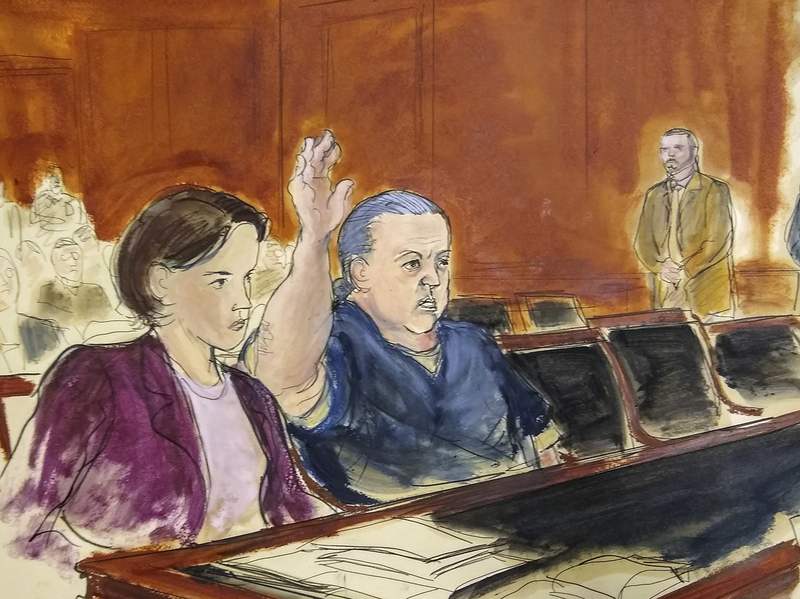 Pipe bomb suspect Cesar Sayoc, who raised his arm to swear to the truth of his statement on Tuesday in New York, received a 30-count indictment on Friday. The man accused of mailing a series of pipe bombs across the country to critics of President Trump — including former President Barack Obama, liberal philanthropist George Soros, actor Robert De Niro and CNN offices — was indicted on Friday. Cesar Sayoc of Aventura, Fla., was charged in Manhattan federal court in a 30-count indictment. Prosecutors say that he sent 16 improvised explosive devices to 13 people through the U.S. mail with an intent to "kill, injure and intimidate." The indictment covers packages mailed to victims in the southern district of New York. The 56-year-old was charged with the use of a weapon of mass destruction, interstate transportation of an explosive, threatening interstate commerce, illegally mailing an explosive, carrying an explosive while committing a felony, and using a destructive device to engage in a violent crime. "He faces life in prison," spokesman Nicholas Biase of the U.S. Attorney's Office of the Southern District of New York told NPR. Between Oct. 22 and Nov. 2, the FBI and the U.S. Postal Service recovered all 16 padded manila envelopes containing IEDs, prosecutors said. The envelopes bore similar features, in addition to a clock, wiring and PVC pipe packed with explosive material: they included a return addressee of "Debbie Wasserman Shultz" – a congresswoman and former chairwoman of the Democratic National Committee — and six self-adhesive postage stamps with the American flag. DNA, including fingerprints on two envelopes, linked Sayoc to many of the devices, prosecutors said. They also identified him by studying his social media accounts, analyzing the contents of the posts as well as their misspellings. He was arrested Oct. 26 at an auto parts store, and charged with five federal crimes, including transporting explosives across state lines, threatening former presidents and assaulting federal officials. Prior to the arrest, the registered Republican was living in a van plastered with pro-Trump and anti-Democrat stickers. One image showed the president standing on a tank with a rifle, complete with United States flag and fireworks. The FBI seized a laptop from the van which contained lists of mailing addresses that matched labels on the envelopes, according to prosecutors. Authorities also said they found Internet searches for victims' addresses on his cell phone. Those queries started as early as July. Sayoc had also amassed a list of more than 100 potential targets. According to the indictment, targeted victims, including Democratic presidential candidate Hillary Clinton, former CIA Director John Brennan and former Director of National Intelligence James Clapper, also received a photograph of themselves with a red "X" on it. In a written statement, Manhattan U.S. Attorney Geoffrey Berman called the pipe bomb mailings "an assault on a nation that values the rule of law, a free press, and tolerance of differences without rancor or resort to violence." He added that it took just five days to identify and arrest Sayoc. "He now faces justice from a nation of laws," Berman said. Sayoc appeared in New York earlier this week after being transferred from Florida. He is being held without bail. Debra Gureghian, who worked with Sayoc at the New River Pizza where he was a delivery driver, told NPR's Greg Myre that he openly spoke about the elimination of Jewish, gay and black people. "He would start talking about Hitler. He loved Hitler - loved Hitler," she said.